Eddie Barber served in submarines in the Home fleet at the beginning of the War and ended up in the Far East on VE day. He visited Hiroshima and was aboard HMS indefatigable when it returned to the UK bearing ex-prisoners of War. He will be missed by all his shipmates at the Cardiff RNA. 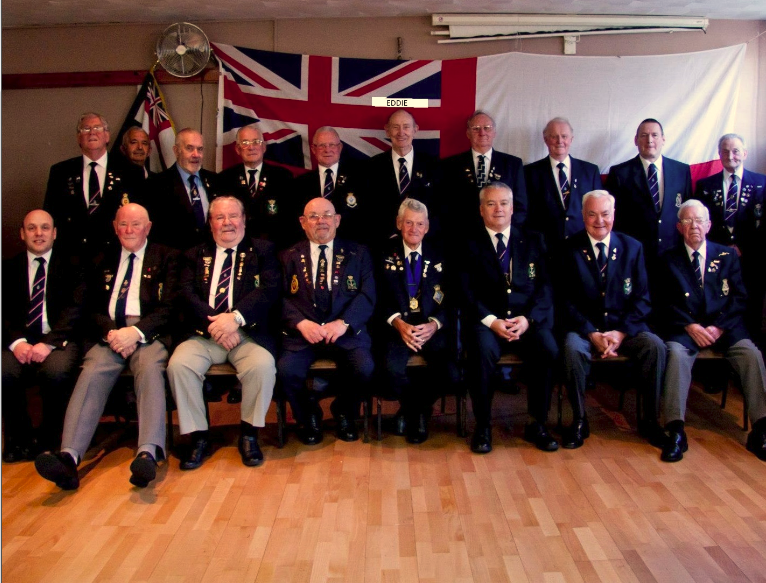 The Cardiff Branch of the Royal Naval Association is sad to report the demise of one of its oldest members, who has been holding its monthly meetings at the British Legion in Rhymney for a number of Years. Eddie’s funeral was held on Tuesday June 9th at which the White Ensign draped the coffin and standards were raised and carried. Eddie Barber is named on the rear row in the image above. However, an ageing membership and subsequent loss of members through ill health and demise, has led to a steady decline in numbers. This has not been helped by the failure to attract new members due to the location of the Branch from the City Centre. It has therefore been decided that, beginning 6th July, the Branch will hold its monthly meetings on the first Monday of the month at the United Services Mess in Wharton Street Cardiff. The informal fortnightly ‘Beanos’ will continue to be held at the City Arms – opposite the Millenium Stadium main entrance. The Branch wishes to thank the Rhymney British Legion for its hospitality to the Royal Naval Association and its members during its tenure.